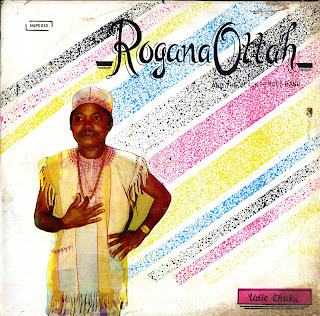 For the next selection on the highlife turntable, I have selected the track Udie Chuku by Rogana Ottah and his Black Heroes Band off a 1990 Rogana Records release Udie Chuku. I've written about Rogana Ottah before when I posted a track he did with the International Brothers and John Beadle has an excellent summary of his discography and career on his website http://biochem.chem.nagoya-u.ac.jp/~endo/EAOttah.html. Even though this is a later release by the artist it still shines. I especially like the laid back vocals and the guitar playing. There are also several nice percussion solos. The liner notes go on to say: The force of Rogana's music is rooted on original African rhythms, the chemistry is a unique fusion of his percussion instruments and the messages says that "Everybody is enjoying the fruit that He or she sow"
Another interesting note is the LP was remixed and mastered at Master Touch Studios in Nashville, Tenn. The LP was originally recorded at Rogers All Stars Recording Studio in Awka. For those who are interested in his music you can get several decent reissues of his work at myafricanbargains.com. Thanks to my friend Anton who played this track for me the other day at his birthday party.